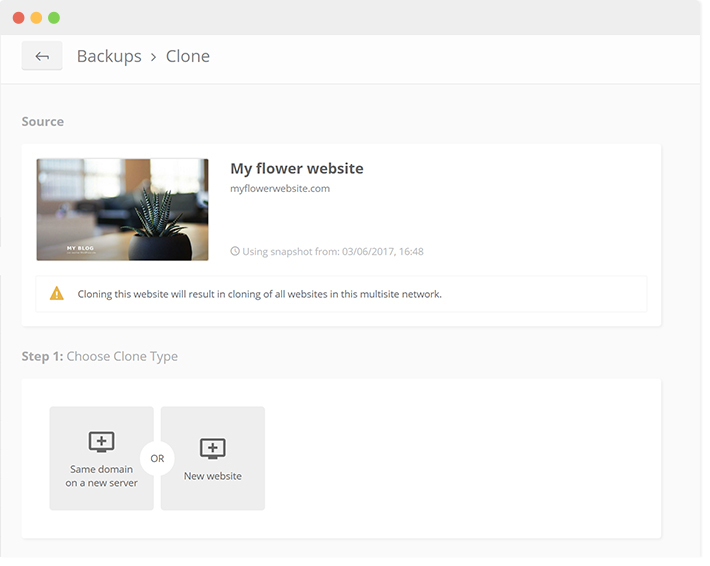 A lot of you have been asking us and today I am happy to announce that you can now perform backups, restore and clone your multisite websites in ManageWP. Your multisite network or your client’s will now be fully supported, so you can rest assured that you will have the latest backup of your network, and be able to restore it, or simply restore individual sub-sites. How does backup work with multisite network? The way our multisite backup works from a technical point of view is no different than the ManageWP backups you all know and love. They are incremental, reliable, and come with off-site storage. This hasn’t changed, we have just made them available to you for your multisite network. It’s important to note that when you perform a backup on a sub-site in a multisite network, the whole multisite network will be backed up. That means that we take everything and back it up to our cloud. Websites in a multisite network share a single database (among other things), so if you don’t back everything up, you will not be able to restore any sub-site from that backup. You might then wonder, what happens if I only want one sub-site backed up. That’s fine and you can decide to backup only one sub-site. Select it, and set the backup frequency that you would like. We will take that sub-site and backup the whole network it’s on, but we will only charge you for that one website. Let me take you through a practical example. You select your website, and you turn the backup tool on. Here is what you will see. The backups are starting at $2 and for that sub-site you will be charged $2. You agree to this and you have activated the add-on, the $2 will be added to your monthly fee. What happens behind the scenes is that we have backed up the whole network. Next you decide that in fact you would like to backup another sub-site on the same multisite network. You go into the individual website, and again select the backup add-on and activate it. However, you realize that instead of having daily backups for this sub-site you need real time backups. Real time backups cost $6 rather than $2. Due to the fact that each backup on a sub-site will backup the whole network, your sub-site backups are connected. That means the frequency on all of your sub-site backups will be set the same. The first sub-site you turned on for $2 will also change to $6, and so rather than paying $8 for one real time and one daily backup, you will be paying $12 for two real time backups. Please note for the sub-sites that you haven’t turned a backup on you will not be charged. You are only charged for the ones you decided to backup, and the thing to remember is that they are connected, so backup frequencies must be set the same. You don’t have to backup your parent website, in order to have a successful sub-site backup. Here you can see that the parent website hasn’t got the backup turned on, but the other two sub-sites do and they are both set at the same frequency, so the charge is the same. Please note here that if you decide to upload your backup to an external destination, you will be uploading the whole multisite network. That means for each sub-site you decide to upload to an external destination, the whole network will be uploaded, and you will be charged for the upload of the whole network. 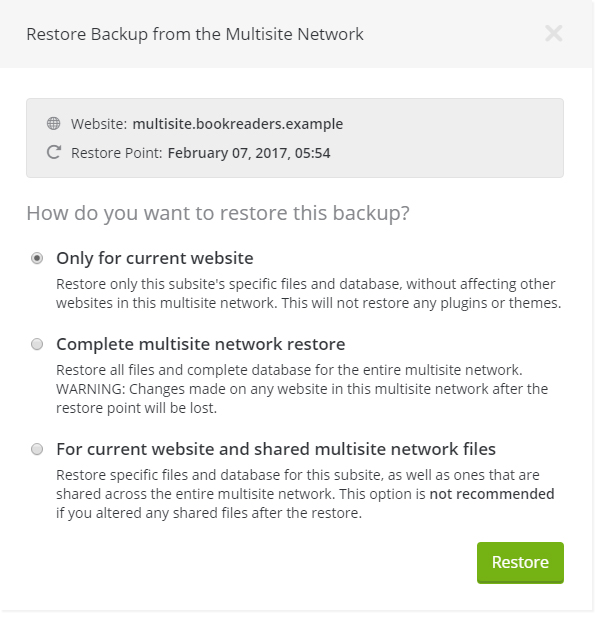 How does restore work with multisite network? The restore feature is very flexible with ManageWP, and you can choose one of three options for your restore. Restore only the selected website. That means that you will be restoring only this sub-site’s files, folders and database tables, without affecting other sub-sites in this multisite network. Bear in mind that plugins and themes will not be restored, since they are shared with the rest of the multisite network. If you have deleted or updated plugins on the multisite network after the restore point, the restored sub-site will not have the latest plugin or theme options. Do a complete multisite restore. This option will restore all files and the complete database for the entire multisite network. Please note that the changes you might have made after the restore point on any sub-site in the network might be lost. This restore option is great if you have a recent backup, so that you have all of the latest changes restored. Restore the selected website and shared multisite network. With this option you will restore files, folders and database tables specific for this website, as well as all files, folders, and tables that are shared across the entire multisite network. In this option you will have all of the latest plugin and theme changes restored, but be careful if you have made changes to any shared folders, files after the selected restore point that could affect all other sub-sites that have not been backed up / restored. How does clone work with multisite network? The Clone feature works exactly the same on your multisite, however you can only clone to a new website. Like with the backup, when cloning a sub-site your whole multisite network will be cloned. The reason for this is because like mentioned before there are multiple sites on a single WordPress installation, therefore they are cloned together. Have a go and try out our multisite support, like always our aim is to create a product that is elegant, powerful and caters to all of your needs. We look forward to your comments and ideas, let us know how you get along. hello. this sounds interesting, but the pricing model does not make any sense to me. if i run a multisite network with 100 small subsites and I want to back up my entire network in order to restore subsites as needed, i will pay $200 per month for a back up service? am i understanding this correctly? this makes no sense, especially if i own the entire network. its not like i will have clients paying me each month to back up their site (subsite). i came to this site based on a link about multisite backup, but your option is a little pricey compared to what is out there, where other providers are also offering ability to extract subsite out to a single site. can you tell me why your service is worth me spending $200 per month for? Our service was built WordPress website management. It was designed for management of individual websites not multisite networks. 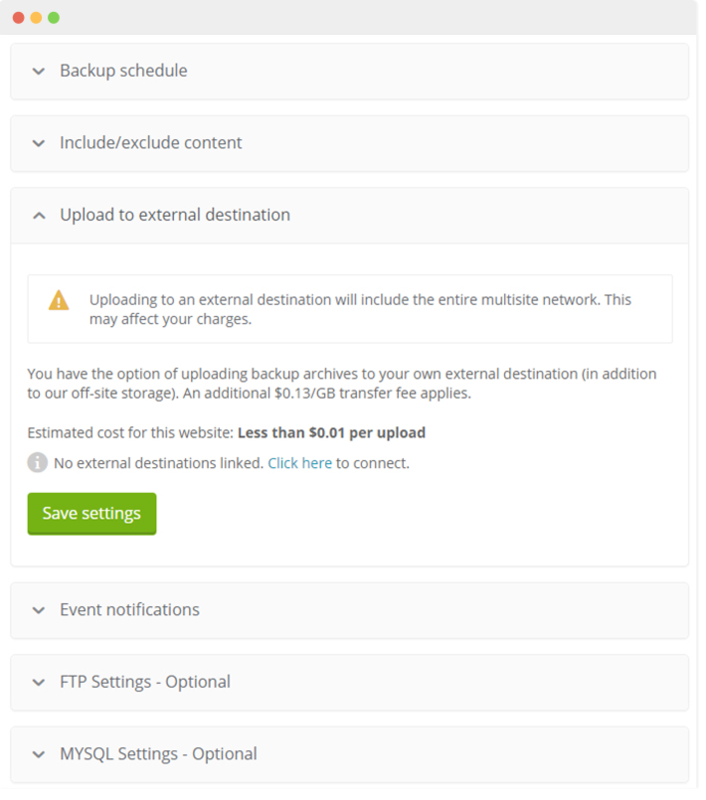 Multisite backups were added as an additional feature. 1. Our monthly backups are free so you can backup each website in your multisite network free of charge. 3. Since our backup is incremental cloud backup – it puts very little strain on your hosting and bandwidth. 4. If you want more regular backups – you could purchase a backup bundle that costs $75 for 100 websites (not $200). I guess my question would be: why wouldn’t you want a single plugin to manage everything? It would be nice if you added the ability export/clone a site OUT of a multisite to a standalone site. The only plugin I have found that does this costs $200 for this functionality. Rather expensive if you only need to do it once in a while. so here is the main problem I can see here. If I have 10 sub-sites, all of whom are paying for monthly backup. 1 customer decides he wants daily backup or real-time backup, but I cannot offer him this unless all other customers agree to pay for this as well, because as you say, all sites will be upgraded to the same backup level. 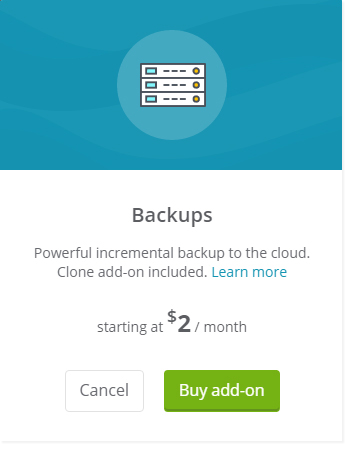 Clealry all customers are not going to pay more for their backup just for the benefit of 1 customer, and I cannot just swallow the cost, otherwise I will be paying more than I am charging the customers. I have created my existing site in to multsite and its working fine as i have checked. But my problem is my each subsite have multiple user. When i have merged it to multisite my sub site user is not visible in user page Dashabord.. I have 5 site in network. can anyone help how i get each site user back ,these user also available in wp_siteid_user table. but not able to see in each site. I think I already know the answer to this but I want to ask it anyway. Here’s the scenario. Were creating a multisite, subdomain network with the parent and five subdomains. Is it possible to build out a single subdomain that will be the master for all additional subdomains, i.e. theme, pages, menus, etc. in this way art is our hope to be able to spin off additional network sites based upon that master template. Possible? Hi Nevena, and sorry for my english. I do not understand well the final price in my case. If I have a multisite site with 6 subdomains and I want to make backups of everything. What is the total cost? And Is not it the same to do a backup of everything instead of a particular subdomain in case you have to restore it? What is the advantage of backing up only some subdomains instead of the entire network? Where are the backups hosted and until what space is available? I consult all this because I need to have an exact final cost. 2) Backup of the whole multisite, and the ability to either restore the whole multisite, or any individual subsite. 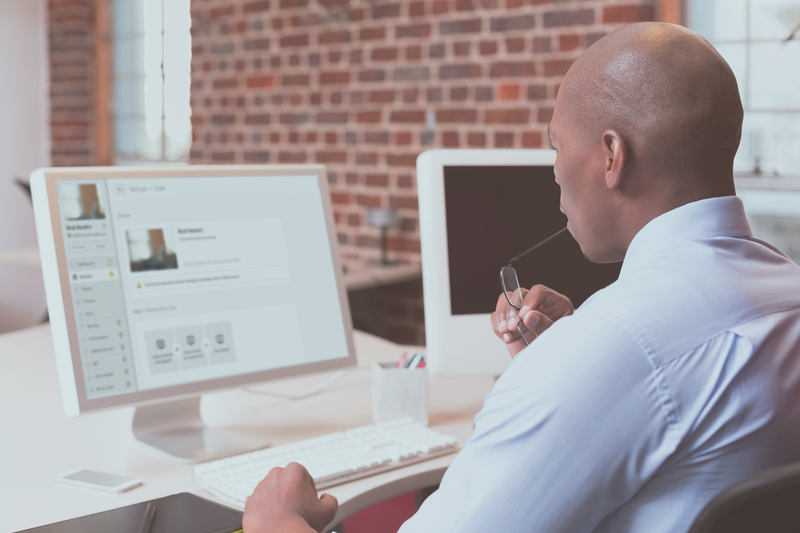 Turn on the premium backup for both the parent site, and each subsite in the network. You will be able to restore subsites without rolling back the changes for the rest of the multisite network. The cost is $14/month (parent + 6 subsites = 7 sites total). Thanks, that make sense ! Nevena, here are a few questions about this new service. Does ManageWP detect the number of sub-sites in the multi-site network and bill accordingly for backup? Or does each sub-site need to be added to ManageWP manually in order for sub-site backup to happen? I have a client site that may eventually grow to 100 or more sub-sites. Will each one need to be added to ManageWP separately in order to be backed up daily? If I do ManageWP backup of only the parent site, does that mean I won’t be able to do individual sub-site restores? We do detect the number of sub-sites and each sub-site is counted as an individual site. So we bill you for each sub-site. Yes you do need to add each sub-site to ManageWP, and perform a backup on it in order to be able to restore it. Performing a backup on the parent site does not mean you can restore a sub-site from that backup. Our multisite support means that we allow you to treat your sub-sites like individual sites – and you can restore them only if you perform backups on them. Hope that answers your questions. If you want more information, you can email in to our customer happiness team and they will take you through the set up in detail. are you sure you want to bill individually for each subsite of a multisite WordPress? That is hardly acceptable in many cases. We are using the multisite feature to separate sections of a website. For example, we have an intranet website with separate subsites as chat rooms for each department or team. There can be a lot of teams (i.e. subsites) – many tens or even hundreds dynamically created (and deleted) as the time goes. It is also hardly possible to add (and remove) each individual sub-site to ManageWP as they are constantly being created and deleted. For a standard backup/restore/clone service you should treat multisite just like an ordinary website, no matter the internal sub-sites structure. Just backup and restore or clone the entire database and file system. And all this should work without the need to individually add all subsites. When you perform a backup, the whole multisite network is backed up so you don’t risk losing anything. You don’t have to add all of your sub-sites to ManageWP, but if you don’t you won’t be able to restore them. The reason behind individual sub-site backups is to give you the ability to restore them individually. I understand your concern, but for now we are focused on having the ability to backup, clone and restore sub-sites and multisites. You suggestion is something to think about, thank you for that. Yeah! Finally! 🙂 Loving your app! Thrilled to see this feature added – thank you! Awesome. Long awaited feature but it’s finally there! Yay! OMG. You don’t know how happy you’ve made me! I left ManageWP last year to try out a different service. But, I was not happy and came back just a few days ago. I’ve been very impressed with the Orion platform – your team in incredible! And, just last night I was planning on emailing to find out when you would make an option for backup that works with multisite and today this comes out. I’m such a fan! Thank you so much! This is great news. I am trying to add a multisite of ours onto ManageWP and all I see is “Add new website” and for me to enter the WP homepage URL. How do add a multisite into ManageWP? Adding multisite follow the same steps as with adding a single WordPress site. You need to network activate the ManageWP Worker plugin in your network admin first. Then, add the main site to ManageWP and choose which sites you want to import to dashboard. If you still have trouble, shoot our support an email and they will help you out. Thank you for finally adding this feature. I appreciate it very much! How exciting!!! I have been waiting for this to be a feature and I am very keen to play. Does this now allow us to peel a subsite off of our multisite and clone just the subsite to a new website? This is a real game-changer for me. Well done!! Glad you are excited. With the clone, you can indeed go to a subsite and clone it, but you will get a whole network clone. The nature of a multisite network requires you to clone everything. You can however restore individual sub-sites. If you are looking to make the most out of the clone for multisites, best thing to do is make a backup of your parent site and clone from there. You can then pick and choose what you would like to restore if you need to.